DEARBORN, Michigan, October 17, 2012 (ENS) – The range anxiety that has troubled hybrid car buyers in the past is fast-fading into the rear view mirror. Ford is poised to roll out a new plug-in hybrid utility vehicle that can travel the 614 miles from Detroit to New York City powered only by its lithium-ion battery and one tank of gas. With a 620-mile overall driving range as rated by the U.S. Environmental Protection Agency, the C-MAX Energi is also America’s most fuel efficient plug-in hybrid. Never has a hybrid traveled so far on so little gas – the C-MAX Energi goes 100 miles on just one gallon. The EPA certifies the C-MAX Energi for 108 miles per gallon equivalent in city driving and 92 MPGe on the highway, for a 100 MPGe combined rating. C-MAX chief engineer John Davis says that with so many Americans facing record gasoline prices, Ford is excited to be saving drivers money at the pump. “C-MAX Energi is America’s most efficient utility vehicle, a great symbol of how Ford gives customers the power to choose leading fuel-efficiency across our lineup with gas prices spiraling upwards of $5 a gallon in some parts of the country,” says Davis. In the first five years, C-MAX Energi customers can save about $7,000 compared with the average new vehicle, states the EPA label, now required on all new cars. Most commuters can get to work in a C-MAX Energi without using a drop of gas, switching over to the gas engine only for the trip home. The average work commute is about 20 miles each way and the C-MAX Energi achieves up to 21 miles in all-electric mode. Drivers can save gas even in congested traffic. This is important in view of a study by the U.S. Treasury Department showing that drivers in traffic jams burned an extra 1.9 billion gallons of fuel in 2011, roughly five percent of all the gas used in the United States that year. That flexibility maximizes the ease of today’s ever-longer commutes. A recent study from New York University’s Rudin School of Transportation shows that the number of people who commute more than 90 miles to work has doubled over the past 10 years. “The 21st century is emerging as the century of the ‘super-commuter,’ a person who works in the central county of a given metropolitan area, but lives beyond the boundaries of that metropolitan area,” write Mitchell Moss and Carson Qing, authors of the Rudin School study. They found that super-commuting is a growing trend in eight of the 10 largest U.S. metropolitan areas. Ford designed this long-range, fuel efficient vehicle for these super commuters, who tend to be young and are more likely to be middle class than the average worker. Ford is targeting the C-MAX Energi to compete with the Toyota Prius plug-in hybrid, which gets just six miles in all-electric mode. The C-MAX Energi can go three times as far before the driver starts the gas engine. When it comes to range, the Toyota Prius plug-in gets 540 miles- 80 miles less than the C-MAX Energi; the Chevy Volt is third with an overall range of 380 miles. The C-MAX Energi is more powerful than the Prius plug-in hybrid, achieving 195 horsepower on a fully-charged battery, 60 more horsepower than the Prius. 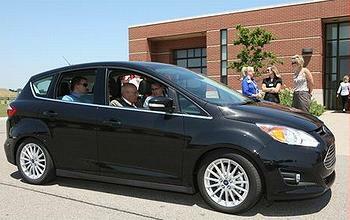 Built at Ford’s Michigan Assembly Plant, the C-MAX Energi features regenerative braking, which captures and reuses more than 95 percent of the vehicle’s braking energy. Advanced Lithium-ion batteries, smaller and lighter than nickel metal hybrid batteries used in earlier generation hybrids, are covered by an eight-year/100,000-mile component warranty. The MyFord Mobile feature enables access via smartphone or computer to monitor a vehicle’s state of charge and current range or locate charge stations and plan routes to find them. Debuting this fall with a price tag of $29,995 after a federal tax credit, the fuel efficient vehicle is Ford’s first production plug-in hybrid – part of Ford’s first dedicated line of hybrids. The C-MAX Energi will arrive this fall at EV Certified Ford dealers in 19 markets, followed by a nationwide roll out early next year.